Enchiladas are a simple staple on my weeknight dinner list. 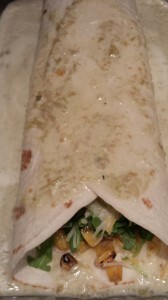 Just grab a flour or corn tortilla, and wrap it around a wonderful filling, top with sauce, bake, and you have a quick meal. My Roasted Corn Enchiladas with Creamy Salsa Verde Sauce are easy to make and chock full of veggies. Roasted vegetables are a hallmark of summer. 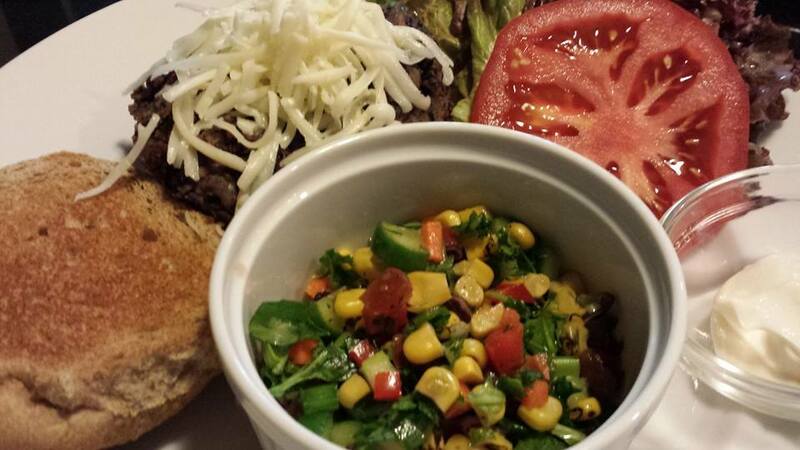 Along with the usual grilling of meats, roasting an ear of corn makes your summer golden. 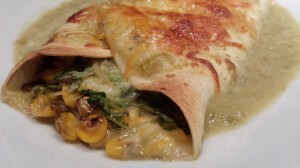 You can use that roasted corn, removed from the cob, of course, in these roasted corn enchiladas. 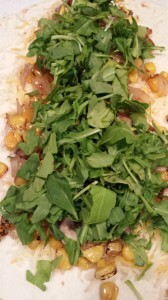 In addition to the roasted corn, I use mushrooms, arugula, and cheese in the filling. 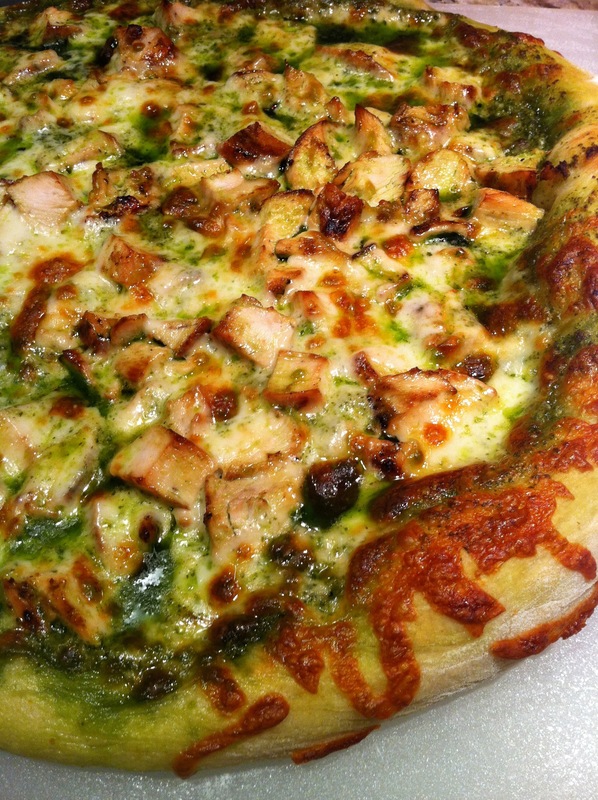 It’s all topped with an easy-to-make creamy green chile sauce. How to start? Set aside two burrito-sized flour tortillas. 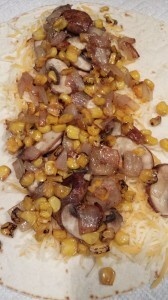 Then, saute some shallots, mushrooms, and your roasted corn in some butter in a non-stick skillet. Trader Joe’s and Whole Foods Markets carry frozen roasted corn if you prefer to purchase it rather than roast it yourself. 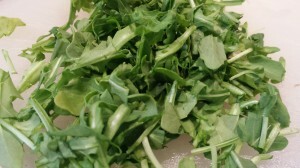 Chop some arugula leaves for the filling. and some chopped arugula leaves. 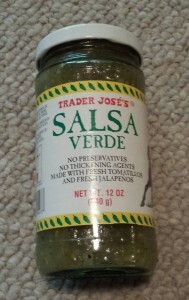 The creamy salsa verde sauce is made from Trader Joe’s Salsa Verde, heavy cream, and vegetable stock. 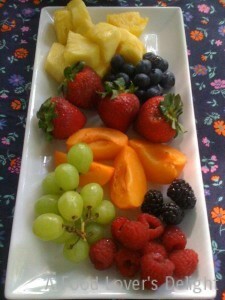 Stir it together in a bowl and use some sauce to blanket the baking dish. 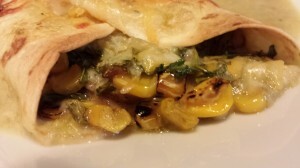 Roll up the tortillas, and top with the creamy salsa verde sauce. Top the enchiladas with a bit more shredded cheese. 2. Spray a baking dish with cooking spray. 3. In a bowl, stir together the salsa verde, cream or milk, and vegetable stock. Set aside. 4. In a non-stick skillet over medium low heat, melt the butter. 5. When the butter has melted, saute the shallots until they are translucent. 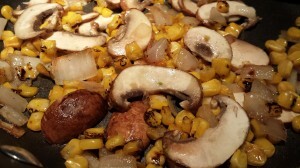 Add the mushrooms, corn, and Mexican oregano and cook until the mushrooms have softened, stirring. Remove the pan from the heat. 6. Place the two flour tortillas on a cutting board. Sprinkle some of the cheese down the middle of each tortilla. 7. Top the cheese with the roasted corn mixture. 8. Add the chopped arugula, and fold the tortillas’ sides over their filling. 9. 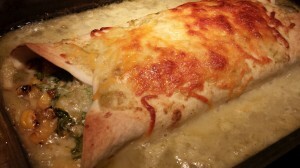 Ladle some creamy salsa verde sauce into the bottom of the baking dish to cover it. 10. Place the filled tortillas into the baking dish. 11. 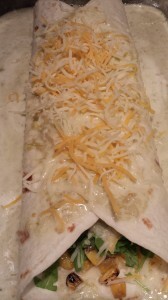 Top with the remaining sauce and the reserved shredded cheese. 12. 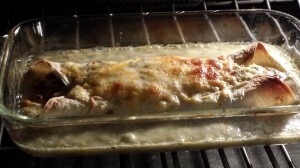 Bake for 10 – 15 minutes until the enchiladas are bubbling and slightly browned. 13. Remove the enchiladas from the oven to cool a bit in the baking dish. 14. Using two spatulas, and lifting each enchilada underneath from both sides, slide the enchiladas onto serving plates, spooning a little bit of sauce around them, and enjoy! Serves 2. 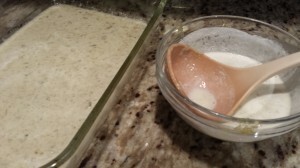 Top with sour cream or Mexican crema. Serve with a side of refried beans. Variations: Add chopped chicken for a meaty dish. Substitute chicken stock for the vegetable stock. You could use fresh spinach instead of arugula. Add some diced zucchini when cooking the roasted corn mixture. Add a few dabs of cream cheese for even more decadence. To lighten this dish, omit the shredded cheese from the filling and topping and the heavy cream from the sauce. Use more vegetable stock in the sauce, or just use water to thin the salsa verde.